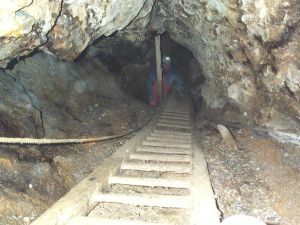 Mining operations on the mountain can be divided into three basic techniques, shallow shafts, open cast and deep mine working. 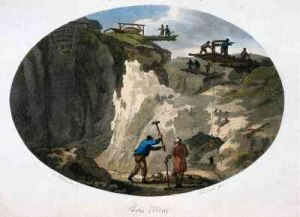 Mining for copper restarted around 1761 when Alexander Fraser moved into Cerreig Y bleddia farm and persuaded the landowner Sir Nicholas Bayly to start to look for copper on the mountain. The area in which the shafts were dug is still called “Hen Waith” or “Old Works” on the modern OS map. These early miners tended to follow outcrops of copper bearing ore down into the ground. The aim was to try and follow the lode bearing vein until it run out. If a particularly good vein was found a simple unlined shaft may be dug to gain better access. The only tools available were simple hand tools. The restricted access meant that gunpowder could not be used. Most of these early shafts suffered from the problem of water ingress. The only methods available to the miners for water removal was by bucket and winch or the digging of an adit. It is hence not surprising that most of these shafts were abandoned. A large vein of ore was discovered in 1768 was rich and said to be only a few feet under the surface. It was quickly developed using shallow surface mining techniques. This large vein was soon developed and a new type of working was used were the large number of shallow shafts were collapsed in on each other to form the Open cast. The large area now available to work in meant that mechanical methods could be used to raise the ore and gunpowder use became common place. 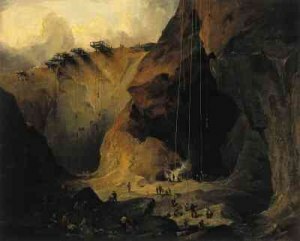 Lentin described that the mine owners soon discovered that the traditional shaft mining techniques that had been used by Frasier’s men on the Mona side of the mountain was leaving a lot of the ore behind. As the ore was near the surface it was decided to try and recovery more of the ore by drift mining techniques that had been used to recover lead from the Parys mine in earlier years. The entrances to the drift mine was large enough for a horse and cart to be driven into the mine to recover the ore. As the works became enlarged pillars and arches of rock were left to support the roof. Eventually the roof was removed and the open cast working begun. In 1798 Bingley visited the mine and gave a very good description of how the ore was recovered. He describes how wooden platforms were built at the top of the open cast jutting out into mid-air. From a hole in the middle of these platforms a man would be lowered in a bucket, known locally as a kibble. 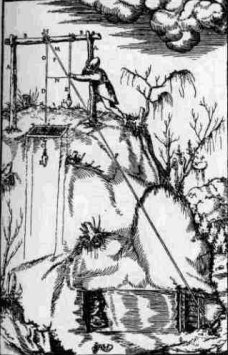 The bucket was attached by rope to a man operated windlass or whimsy on the platform. In around 1790 over 1200 people were employed at the mine. This had reduced to around 1000 by 1798 and was further reduced to around 200 men by 1806. The main period of opencast working came to an end at about the same time as Thomas William’s death in 1802. In 1811 a new company began to explore the mines. A number of Cornish men were brought in and deep mining with shafts was started. The remains of some of these shafts can still be seen on the mountain today. Most of the shafts were around 6 foot square and had sides that were boarded with timber to prevent falls. ladders were attached to the side of the shaft for access. In 1819 Faraday visited the Mona mine and described his decent down one of the shafts. “We followed Captain Leaman ( Treweek) to a small shaft and a little distance from the office and in such true miners style that I verily believe the men themselves did not know us for other than miners. The place we prepared to descend was a small aperture in the earth about 4 ft. by 3 ft. wide and a ladder appeared at its mouth which descended into the darkness below. Captain Leaman chose this shaft because it was the most comfortable. There were two others but the pump rods worked up and down in one and in the other we could only ascend and descend in the buckets like lumps of ore. Having taken a lesson how to hold our candles we got on to the ladder. It was not long but on reaching its termination we had to swing around it by a little stage on to a second and from that on to a third and so on until I lost count of their number.